How does a Ouija board work? 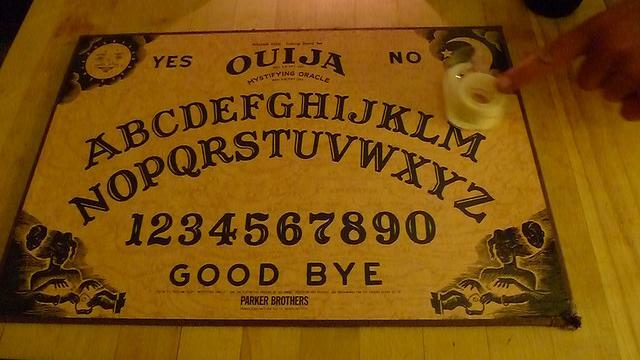 A Ouija board is a tool used to communicate with spirits of the dead. It can also be used to communicate with demons and other negative entities and for this reason, a Ouija board should be considered dangerous. The writing on the Ouija board consists of four words, 26 letters and 10 numbers. It has Hello, Goodbye, Yes and No written in the four corners. Across the top of the board is the alphabet from A-Z. In the bottom half of the board are the numbers 0-9. A planchette is the device used to spell out or indicate answers on the board. Sometimes this is made of wood, but it can also be a glass or any item which freely moves across the board. The users gather round the board and lightly rest one finger on top of the planchette. The planchette them moves around the board, spelling out the message from the spirit. How does the Ouija board Planchette move? There are two different ideas around how the spirit moves the planchette to spell out their message. One idea is that the spirit is able to move the planchette by themselves and physically pushes or pulls it to the letter they are trying to use to spell out their message. If this is the case, then it does raise the question why people need to hold the planchette at all. Why doesn’t the spirit just move it by themselves? Well this can be explained by the fact that the spirit needs the energy of the people holding the glass to move it. It uses the energy of the people on the board to move the Planchette. This means that the more people on the board, the faster the Planchette should move. The other idea is that the spirit actually possesses the people on the board and through their bodies, spells out the message it is trying to get across. The people on the board will actually be pushing the Planchette across the board, but may not realise that they are doing it. This also explains why the Planchette cannot move on its own. Previous: Previous post: Is a Ouija board dangerous? Next: Next post: Are Demons Real?